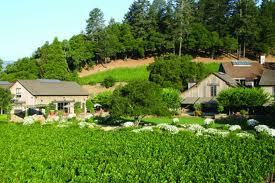 Ed and I attended a lovely reception and dinner, which was part of the third annual Volley in the Valley Tennis Tournament, at the Napa Valley Reserve. The Reserve is a private wine estate, where members can make wine without the hassles associated with making wine. Members can participate as much or as little as they like. With their membership fee and agreement to purchase a certain amount of wine, they can have terrific wine for their own personal use; they just can't sell it. The tournament itself was held at Meadowood, in St. Helena, to raise money for the Adventist Heart Institute, which directly benefits St. Helena Hospital. The champagne reception was held in the Reserve's outdoor Pavilion Patio and the dinner in the Pavilion Dining Room. My favorite part of the dinner prepared by Estate Chef Alejandro Ayala was the lovely, light, "sweet" starter Sweet Pea Agnolotti, with pea tendrils, green garlic and lemon. The highlight of the evening was the featured speakers: Dr. Gan Dinnington, Cardiothorasic Surgeon, St Helena Hospital; Peter Magowan, President and Managing General Partner, San Francisco Giants, 1993-2008; and Jeff Greenwald, MFT, and author of The Best Tennis of Your Life and Fearless Tennis. What I hope I will remember most from Greenwald is that, after missing a point in tennis (as in life) let the windshield wiper totally wipe it away and go on to the next point. With our nephew Joel and his fiance Casey, we made our way over to Yountville for terrific dinner, of an arugula/prosciutto salad, lamb sirloin--grilled after it was prepared sous vide, a cheese course of goat gouda with honey and peach jam and an insane flourless chocolate cake in a jar. After giving up a table in a noisy area, we were happy as clams, especially after they turned the music down. While we were in D.C. for the University of Notre Dame's President's Circle Perspectives on National & Global Issues, Ed and I dined at Corduroy restauant, across the street from the Convention Center. And what a lovely evening we had. First of all, we were offered a comfortable booth, where we able to sit side by side. Second, the room was clean-lined and well insulated, so we had some easy-to-hear conversations. Lastly, the food by Tom Power--a deciple of Michel Richard--friendly service and wine were all stellar. We ordered the 5-course surprise menu, the highlight of which was the lobster carpaccio with drawn butter and chevril. One of our desserts was chocolate, handmade kit kats. Mmmmmmm. And to accompany everything we had an '05 DuNah Pinot Noir from the Sonoma Coast, which was delish. We will certainly try to get more of that wine now that we are back in Napa Valley. University of Notre Dame Symposium in D.C.
Media panalists Mark Shields, PBS News Hour and Inside Washington; Jerry Seib, Washington bureau chief for the Wall Street Journal; Daniel J. Balz, American jounalist Washington Post; Pete Wehner, Commentary magazine and National Review online; and Jeanne Cummings, Government Team Deputy Editor at Bloomberg News. Whew, what a line-up of impressive and divergent views; however, one thing everyone seemed to agree on was that demographics was the key to the next election. The dinner where the guest speaker was Jeb Bush was held at the Smithsonian American Art Museum and National Portrait Gallery, part of the Donald W. Reynolds Center, a gloriously renovated National Historic Landmark building, where President Abraham Lincoln held his inaugural ball. We were where history was made! Before going to the screening in Chelsea of "Mr. Jones," which was part of the Tribeca Film Festival, we met up with our good friends Sarah and Jay Sung at Montmartre --a French-American restaurant. Dinner was delicious, prepared by Vietnamese star chef Tien Ho, formerly of Momofuku. The six-month old restaurant was bustling and cozy, with a trendy vibe. Our friends Sarah and Jay live in Manhattan, where he is CEO of Lot 18, a membership by invitation website for wine, which provides high-quality, hard-to-find wines at attractive prices. In April, Ed and I attended a screening of the indie horror movie "Mr. Jones,'" directed by Karl Mueller, at the Tribeca Film Festival, at the Chelsea Cinemas, in my home town of NYC. The film is about a couple played by Jon Foster and Sarah Jones, who rent a house in the middle of nowhere. In the house next door is a creepy artist neighbor, who sends sculptures to people at random with creepy results. I normally don't watch horror films as I end up either covering my eyes or leaving the room for most of the film, but this film was produced by friend Ross Dinerstein, who produced "The Divide," which we saw at the Southwest by Southwest film festival and liked. "Mr Jones" was eerie, but I made it to the end without any time outs!